How do you derive reliability goals and loads for your new product? How do you test cost-benefit optimally? How can you learn from previous products? These and numerous other questions can be answered with reliability management processes and methods. We help you to ask the right questions and answer them competently. We together work with you to develop the processes that fit your company, develop training concepts with you and help you implement the necessary methods. If desired, we can also program the appropriate special software for you, e.g. to create a partially automated test planning or to evaluate field data. Of course you determine the degree of support! In other words: We are your competent partner for an integrated reliability management. 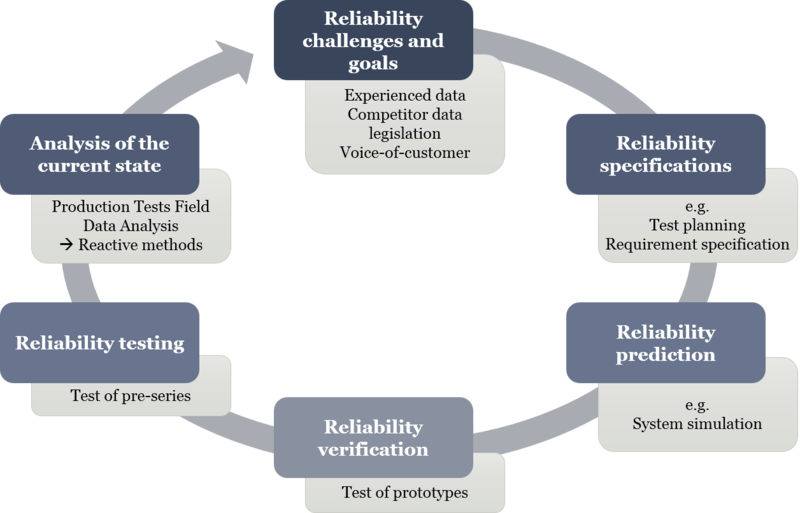 Reliability management means defining reliability specifications at an early stage in the product development process and monitoring their development in sense of reliability growth throughout the entire product development process. But reliability management does not stop after the start of production. Even during field operation, modern methods of field data evaluation and pattern recognition procedures are used to carry out passive market observation on the one hand and to generate important input for new development projects on the other. It is important that reliability flows into the corporate culture and is not a one-off event. An organisational and procedural anchoring in the company is therefore indispensable. Numerous standards and guidelines, such as VDI 4004, DIN 60300 or VDA 3.1 and 3.2, deal with the subject of reliability and are mastered by our experts. As already mentioned, reliability management can be divided into a preventive and a reactive area. Both of these branches are intertwined, exchange information in the ideal case and ensure an integrated approach to reliability management. Preventive and reactive reliability management are described in more detail below. Preventive reliability management deals with questions of reliability during the product development process (PDP) to identify potential and errors as early as possible and to remedy these cost-efficiently. The goal is to design a highly reliable and safe product that is characterised by minimum failures in the field and consequently low guarantee and warranty costs. Furthermore, reliability growth should also be ensured. The following figure shows an integrated reliability process, the likes of which has already been implemented by IQZ staff for well-known companies. Reactive reliability management relates to all phases of the product life cycle following delivery of the product to the customer. Thereby it is attempted to make statements on the reliability of the corresponding products on the basis of real field data. Methods also exist that can be used to determine key errors from data. These should always precede a reliability analysis of field data to focus the later analytical work on critical problem cases. This means that financial as well as personnel capacities are not spread evenly over all products according to scattergun approach but can be deployed selectively. The results from field data analyses – e.g. from a reliability forecast – are ideal to support preventive reliability management. Reliability requirements and thus goals can be formulated with these, amongst other things, and these constitute an important basis for the development process. Field data analyses remain a suitable aid in guarantee and warranty management. They can be used to forecast guarantee costs, estimate the risks of extended warranties or verify recall campaigns. In addition, field data analyses supply decision-making aids when calculating the replacement demand for series or final stockpiling. Thus, they are an important part of obsolescence and spare parts management. and describe in a purposeful way. In practice, the Weibull analysis is used in particular for the analysis and evaluation of field complaints as well as for statistical test validation (e.g. proof of operational strengths) in order to derive targeted measures on the basis of the analysis results. In both cases, the aim is to describe the available database and, if necessary, to forecast future probabilities of occurrence, taking into account the associated static confidence. We offer you the necessary tools, analyze your data and support you in creating the required evaluations including the documentation(s) suitable for your application – Do not hesitate to contact us, we will be happy to help you. 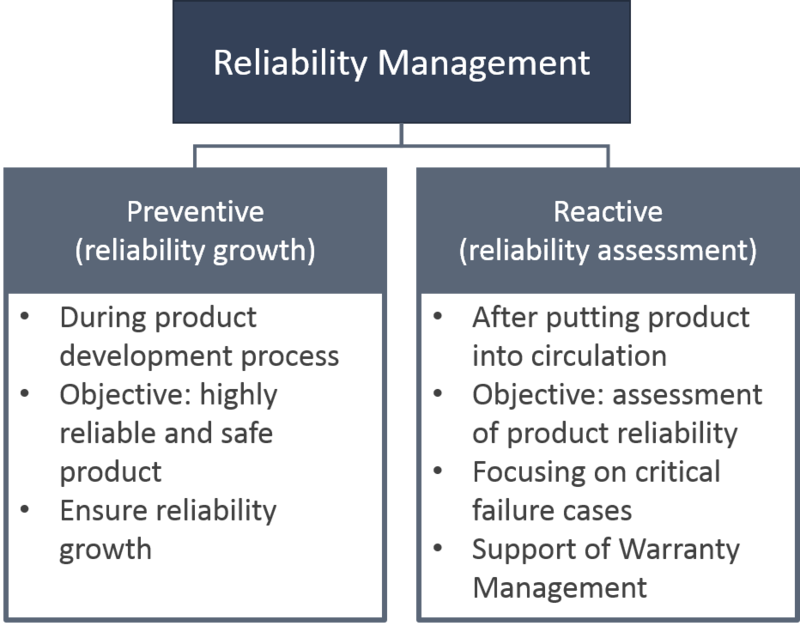 Many questions in quality management – especially in Warranty Management – are based directly on reliability prognoses, e.g. 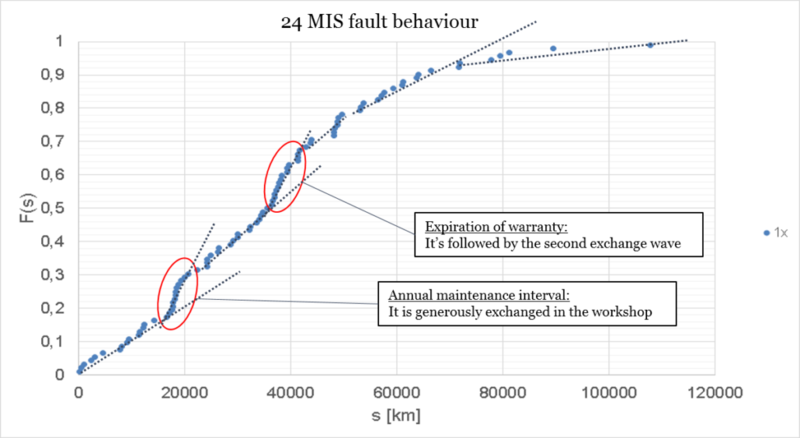 the determination of the expected failures in the field or the expected warranty costs. But also the determination of final stocking and spare part quantities, the evaluation of different concepts, constructions and technologies over long periods of use as well as the estimation of possible risks belong to it. The following explanations refer to the automotive sector, but are generally applicable to all sectors in which technical products are manufactured and used. Test series, endurance runs and time-lapse tests serve to fundamentally secure the functionality and robustness of automotive components. Due to the small sample sizes, however, they cannot answer the above-mentioned questions and the correlation between test and real field application is unknown. In contrast, field data reflect the real operating conditions and all relevant load factors, which is why they are a good basis for describing the failure behaviour in the field. As a rule, there are sufficient failures for larger series deliveries, which ensures good statistical significance. However, the complete recording of field failures only takes place during the warranty period, which is why the data is censored over time and therefore not complete. The time difference between registration of the vehicle and failure of the component of interest is not suitable for recording its load. For this the pure operating time would be necessary, which is however usually not seized and thus unknown. The route driven until the failure can serve as an adequate replacement for this, which is proven by extensive investigations. However, the driving behaviour during the observation limited to the warranty period is very different (from a few thousand km to over 100 Tkm). This must therefore be taken into account when making reliability statements. The procedure of a reliability prognosis is shown below. The aim of test and inspection planning is to prove that a required characteristic meets the requirements using a defined characteristic (usually time, cycles, operations). In reliability engineering it is usually tested whether the minimum required reliability (probability of survival) of a sample (also: lot, collective), which originates from a population, can be proven over a defined period of time. The entire procedure is based on the so-called hypothesis test, in which it is checked whether the sample fulfils the null hypothesis. If this is the case, the null hypothesis is assumed. If the null hypothesis is rejected, the alternative hypothesis is assumed. The actual test procedures can be very complex and expensive. Therefore, the first step is to determine a meaningful and meaningful test. Even a cheap or quick test is useless if the statements that are to be made afterwards can be derived from the test results. Once a suitable test has been determined, the test time required and the costs incurred are of particular interest. In the following some tests are described briefly with the test procedures as well as the advantages and disadvantages. In this procedure, the sample is tested over a period of time to demonstrate a defined minimum reliability. As the name suggests, all tested parts must “survive” the test without failure. One advantage is that the test is very simple. The result is also unambiguous and is not subject to any subjective evaluation as long as a failure is clearly defined. Furthermore, as soon as the general failure behavior (early/wear failure) is known, an optimization between test duration and number of test items can be carried out. In the case of early failure behavior, for example, the general rule is that more parts are tested and the test time can be shortened. In the case of wear behaviour, the opposite applies. The main disadvantage is that no statements can be made about the course of the failure probability on the basis of the test results. This is particularly unfavorable if a component fails, since not only does the test fail, but only a small amount of additional information can be obtained. This test can therefore be very disadvantageous, especially for components subject to wear and tear and thus long test times. In this test, the sample is divided into several classes, each with the same number of specimens. Each class is now tested until one of the test items fails. The intact test items are not further tested. The failure behavior is then determined using a rank size distribution, since the failure data is a special case of censoring. The advantage of this test is the division into classes, so that even on smaller test benches it is often possible to carry out the test. The determination of the failure function is also particularly helpful, as it generates a great deal of knowledge about the components. However, this test can be disadvantageous for components with wear-prone failure behavior, since the test durations in the individual classes can be very high. The higher effort for test planning is also often seen as a disadvantage, which can often be neglected in the case of long test times. In the lifetime tests, the specimens are tested over a pre-determined period of time, with a certain number of failures permitted. The failed specimens are not replaced. 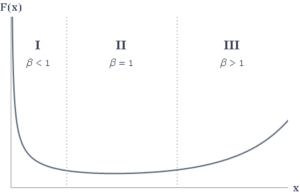 The minimum reliability can then be determined using the determined failure times and a confidence interval. Basically, the success run test is a special case of the lifetime test. The advantages of this test are that test specimens may fail and, furthermore, a simple determination of parameters of the Weibull distribution is possible, which are often used in reliability technology. But even with this method there is the possibility of a very long test duration. In this test, the inspection lot is tested until all components have failed. The downtimes can then be used to determine the failure behavior. This test is a special case of the sudden death test, where each class has only one candidate and is usually used only for robustness protection. The advantage of this method compared to others is that complete knowledge about the failure behaviour of the sample is available. However, this can only be used meaningfully with a corresponding number of test items. The disadvantage is the usually very long test duration. In test and test planning, further methods can be added to shorten the test time, such as increasing the load through temperature, humidity, etc. The test time can also be shortened by using a test plan. You’ve got questions about the reliability management? 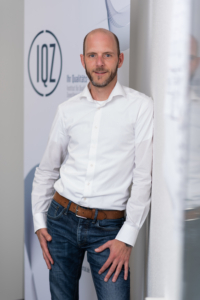 Feel free to contact Dirk Althaus!